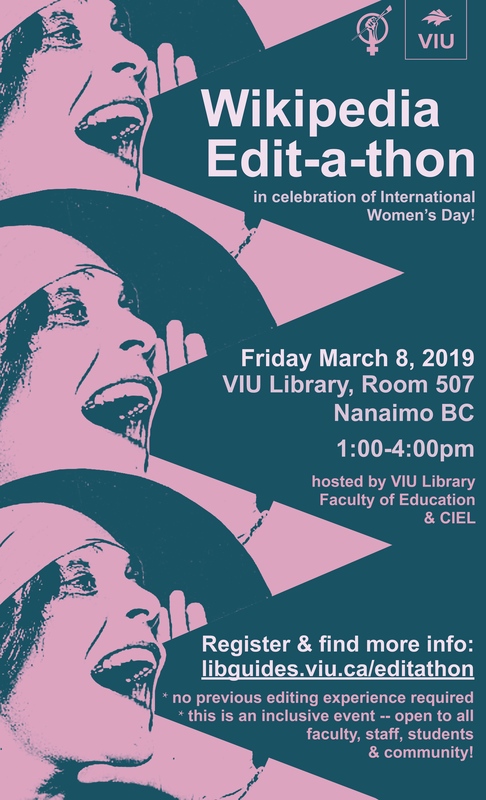 Join us on International Women's Day for VIU’s 3rd Wikipedia Edit-a-thon & Community of Practice Meet up in Nanaimo! Wikipedia is one of the largest websites on the internet, with more than 40 million articles in more than 250 different languages, but women make up less than 10% of editors. This means women's stories aren't being told. This is an inclusive event, and everyone is welcome. No previous editing skills or Wikipedia knowledge required — all skill levels from novice, to more experienced Wikipedians, are encouraged to take part. We’ll cover the basics of editing on this platform, address underrepresentation, and get to work editing live content on Wikipedia. What is a Wikipedia Edit-a-thon? There will be free food and refreshments! Anyone and everyone interested in learning more about editing Wikipedia, regardless of experience, gender, or background, is welcome to attend. Please bring your laptop & power cord if you can. Don't have your own laptop? No problem! We will have extras on hand for those who need one. How can I get in touch with the organisers?